I’ve been a fan of REN for a long time. Their famous Rose Otto bath is my favourite bathing treat of all time. I love the combination of the clean, simple packaging and high-tech, yet natural formulas. They’re also free from synthetics, mineral oils, sulphates. And, probably the most important thing, on a day to day basis, they just feel great to use and I’ve never never had a bad reaction from any of their products. REN Rosa Centifolia Cleansing Gel: This was initially from a sample on the cover of Red, but I liked it so much, I bought a full sized version. I like to use a wash off cleanser at the start of the day to wake me up properly and this one is gentle, with the beautiful fragrance of rose. It doesn’t foam up, doesn’t leave my skin feeling too tight and is a great product. REN Vita Mineral Day Cream: This is a lovely, simple day moisturiser. I’ve used the sample up, but I’m not going to buy a full sized version, as I’m likely to replace it with something a bit more luxurious (I’m old, you see, I need something for my wrinkles!) but if you’re looking for a nice, every day moisturiser, this could well be it. 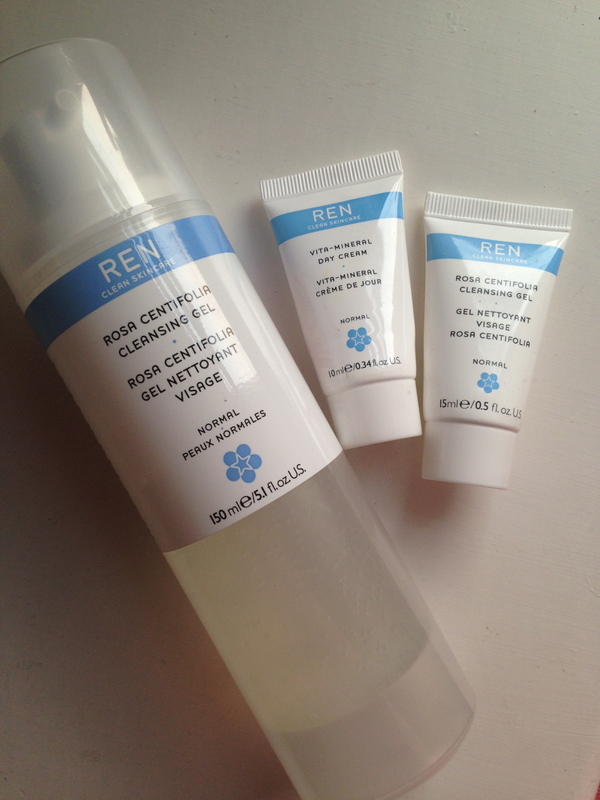 REN Rosa Centifolia 3-in-1 Cleansing Water: I bought this product to use at the end of the day, and I love how clean my skin feels once I’ve used this product, with the cotton wool pads clearly showing the grime that’s been removed! Unfortunately, it doesn’t work terribly well on waterproof eye make up, so I need to find something else to remove that. (Incidentally, I recently bought Boots Botanics All Bright Soothing Eye Make Up Remover to do that job. It makes my eyes really sting. I should have guessed from the warning not to get it in your eyes. Of all the products I use, eye make up remover really is the one that’s likely to get in my eyes, isn’t it!) Micellar waters have been really popular in Europe for years but we only seem to be seeing them more recently in the UK. I really like how simple they feel to use, literally like using just water, and I’ll buy one again. Though there are a few others that I’d like to try, this REN one is really nice. REN ClearCalm 3 Replenishing Clarity Serum. I struggle a bit with the fact that my skin is dehydrated yet I have breakouts and blemishes. This product helps deal with the dehydration whilst also helping to reduce any spots I might have. It’s really simple to use, morning and evening on cleansed skin and is relatively frangrance-free. Unlike many spot clearing type products, it’s not astringent, as it’s adding moisture rather than removing it, and I absolutely love it. I’ll definitely be replacing this one once I’ve used it all up. So, all the new REN products I’ve been using are firmly recommended. I’m going to try a night cream next, so if there’s one from the range that you recommend, do let me know!